Set of 4 placemats includes 2 mats of each of 2 patterns. 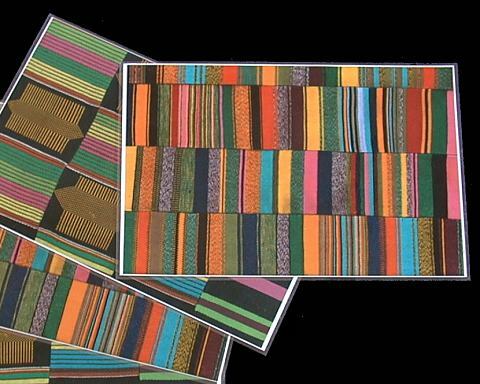 These handsome prints of authentic hand-woven Ewe Kente cloth bring the warmth and beauty of Africa onto your table where you share meals with family and friends. The look is so real yet cleaning is simple, thanks to the laminated surface. Your children will love using them and learn about Africa at the same time. Each placemat has a map of Africa, information about the weaver, and the story behind the patterns clearly displayed on the reverse side (the Kente ones have an African recipe too! == click photo to see back side).